The new ESPN+ streaming service provides consumers with both pre-recorded and live content. The latter includes sports from sources like MLB (one live game per day), NHL (one live game per day), MLS (the entire out-of-market schedule), PGA Tour Golf (50 days of coverage from 20 events), and a pile of collegiate sports. Other content will include original documentaries, series, shows, and a library of past sporting events. For the full details, check out the "ESPN+ Programming" section of the press release included below. It's a long list with a lot of exceptions and suggestively specific language. You should probably take all this to mean that whatever content is being provided, it's pretty much guaranteed to be more limited in variety and coverage than the cable channels. The Ringer has a good and appropriately critical analysis of the content, for interested parties. ESPN+ will run $4.99 a month or $49.99 a year. If you sign up in the next week, you also get an extended 30-day trial (normally a 7-day trial). The service is currently available on Amazon devices, Apple devices, and Android devices including phones and Android TV—with Chromecast support advertised. 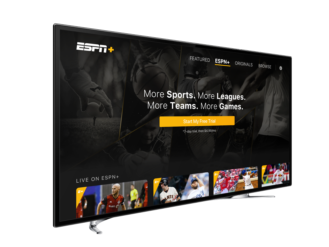 - Introducing ESPN+: Stream thousands of live sports events (including NHL, MLB, NHL, MLS, NCAA, golf, boxing, tennis, rugby and more), original shows or binge watch the entire 30 for 30 library. Get started in the new Watch tab. - Home Tab: Home will display content such as highlights and scores from everything you care about. Throughout the day it will dynamically change based on what you need to know, breaking news and if your teams are playing right now! The new version is 6.0.1, and it can be downloaded at Google Play, or via APK Mirror, if you don't happen to see it on your device. BURBANK, Calif. & BRISTOL, Conn.--(BUSINESS WIRE)--The new ESPN App launches today with a completely re-imagined experience that includes the seamless integration of ESPN+, the first-ever multi-sport, direct-to-consumer premium subscription streaming service from The Walt Disney Company’s Direct-to-Consumer and International group, in partnership with ESPN. At launch, the new ESPN App will be presented by Audi and ESPN+ will be backed by American Express. 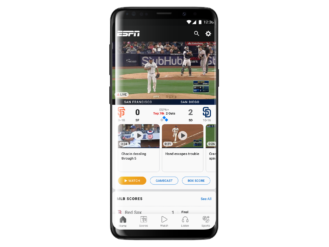 Already the industry benchmark and number one sports app, the new ESPN App – now combined with ESPN+ – elevates the digital sports experience, giving sports fans the premier, all-in-one digital sports platform with easy access to all of ESPN’s news, scores, analysis, video and audio content. 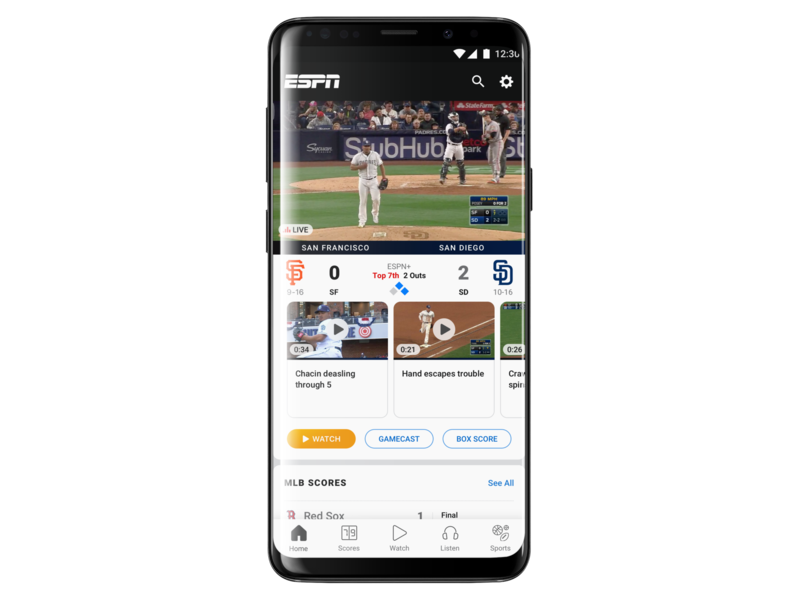 With enhanced design and mobility in mind, the new ESPN app and ESPN+ are available across mobile and connected living room devices -- with an optimized experience for each platform. HOME: The most personalized and complete content experience. A dynamic feed that allows each fan to be presented with any type of relevant ESPN content and coverage -- scores, news, video clips, live events, features, analysis, graphics, statistics and more. The home feed balances what is important to each individual fan and the most important and compelling content that ESPN knows sports fans need. NHL – Beginning with the 2018-19 season, a daily game throughout the regular season (in keeping with the NHL schedule), a total of more than 180 hockey games* -- as well as on-demand replays of the 2018 Stanley Cup Playoffs. In The Crease (NHL) – A nightly hockey show co-hosted by ESPN's Linda Cohn and Barry Melrose providing comprehensive highlights and analysis. Becoming – A program for youth and families, profiling the journeys of some of today's top athletes and how they got their start. Co-executive produced by LeBron James and business partner Maverick Carter. Indy 500 – More than 50 annual documentaries capturing the stories of one of the world’s greatest auto racing events, from the 1960s to present day.